This biography is also available on the Treasury of Lives website, an on-line encyclopedia of Himalayan religious masters, here. The biographer Minyak Gönpo (mi nyag dgon po, 1923-2008)1 wrote of Ngawang Yeshey T’upten as follows: Abbot of the Mongolian Khuré monastery (sog khu re dgon pa2), Rabjampa Ngawang Lobzang (rab ‘byams pa ngag dbang blo bzang3) or Yéshey T’ubten (ye shes thub bstan4) was born in the nineteenth century in the country of Mongolia. At the age of seven, he took the Upāsaka vows (of a lay Buddhist, dge bsnyen) under the fully ordained monk Drakpa Tséring (dge slong grags pa tshe ring5), and was given the name ‘Lobzang T’ubten’ (blo bzang thub bstan). At the age of seventeen, he received simultaneously the vows of a renunciate (who ‘leaves the home life’, rab byung) and Śrāmaṇera (novice monk, dge tshul) from Jé Ngawang Khaydrub (rje ngag dbang mkhas grub, 1779-18386), who gave him the name Ngawang T’ubten (ngag dbang thub bstan). At the age of thirty, he received the Bhikṣu vows (of full monastic ordination) from Panch’en Lobzang Pëlden Tenpae Nyima (the 7th Panchen Lama Rinpoché, 1782–1853, pan chen blo bzang dpal ldan bstan pa’i nyi ma7). When he was somewhat younger, he did his monastic training and education at Khuré Monastery. When he reached maturity, he traveled to the monastic sites in Ü and Tsang (in Central Tibet). He sought guidance from some tens of spiritual teachers such as Gyëlwang Ts’ultr’im Gyamts’o (the 10th Dalai Lama, 1816-1837, rgyal dbang tshul khrim rgya mtsho8), Panch’en Tenpae Nyima (the aforementioned Panchen Lama) and Ts’éch’ok Ling Yéshey Tendzin (tshe mchog gling ye shes bstan ‘dzin9), from whom he received many wondrous Dharmas. After he returned to the country of Mongolia, he was appointed to the position as abbot of Khuré Monastery. The Emperor [of China10] bestowed upon him the honorific title of ‘Nominhan, Abbot of Khuré’ (khu re’i mkhan po no min han11). He lived for a long time, and there exist works of his excellent exposition written even when he had reached the age of eighty-two (82). His collected writings, consisting of a full ninety titles12, have been assembled into a single compilation and made into two volumes, and the original texts from the Mongolian Khuré Monastery are extant in the Nationalities Library (in Beijing, China, mi rigs dpe mdzod khang). They cover about one hundred and sixty subjects, including various biographies, as well as records of teaching he had received and their transmission lines (thob yig), examples of poetry (or demonstrative poetic manuals, snyan ngag dper rjod), various ‘alphabetic compositions’ (often poetic, ka rstom) and works related to rituals (cho ga’i skor13). Translated from the Tibetan, written and researched by Erick Tsiknopoulos, late March to early April 2015, McLeod Ganj-Dharamsala, India. The biography here (at the end of his list of collected works) is the exact same as that by Mi nyag mGon po, but he is not credited as the author. 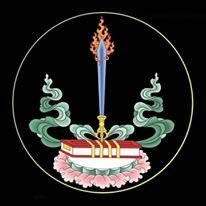 1 TBRC Resource ID: P6212 “Modern Tibetan scholar; he was a major disciple of ‘bo gangs dkar karma bshad sgrub chos kyi seng+ge. Born rab byung 15 chu phag (1923); died at the age of 83 in rab byung 17 sa byi on the 24th day of the 4th month (2008). Source information from Zenkar Tudeng Nima”. His is the only relevant biography I could find, in gangs can mkhas dbang rim byon gyi rnam thar mdor bsdus (‘Sequential Brief Biographies of Master Scholars in the Snowy Land’). The same biography also reappears in the gsung ‘bum dkar chag (table of contents to the collected works) of Ngag-dbang Ye-shes Thub-bstan, without crediting Mi nyag mGon po. 2 Information on this monastery under this name (khu re) seems scarce; it may be Da Khure Monastery in the capital of Mongolia, Ulaan Baatar, which is famous and now a museum. 3 This (rab ‘byams pa ngag dbang blo bzang) appears to be his main alternate name. Rab ‘byams pa is a title indicating the completion of a high level of study, perhaps but not necessarily as much as the complete dGe bshes curriculum. His exact level of study is not made clear in this biography. Here rab ‘byams pa is more an honorific term of respect for his learning than a specific title of his educational degree. 7 This, the only specific reference in the biography to an age which can be checked against another, would place the birth date of Ngawang Yéshey Thubten at no later than 1822-23, because he took his full ordination vows at the age of 30 from the Panchen Lama and the 7th Panchen Lama lived until 1853. He also received teachings from this same Panchen Lama in Central Tibet, as stated later in the biography, ‘when he had reached maturity’, sku nar son pa’i skabs su. He probably took his full ordination vows from the Panchen Lama around the same time (give or take a few years) that he received teachings from the Panchen Lama in Central Tibet. Also, the age of 30 is an age which also gene5) who lirally signifies ‘reaching maturity’ in Tibet and elsewhere, although this ‘maturity’ could also mean as young as 22, according to general Tibetan tradition. However, because in the same place the text mentions that he received teachings in Central Tibet from the 10th Dalai Lama, who only lived until 1837, at this same time of ‘reaching maturity’, he was probably born somewhere between 1807 and 1815, that is, 22-30 years before the death of the 10th Dalai Lama. Since he lived for at least 82 years, this would place his death date somewhere between 1889 and 1897. 9 This was probably the reincarnate lama of Yongdzin Ts’éch’ok Ling Yéshey Gyëlts’en (yongs ‘dzin tshe mchog gling ye shes rgyal mtshan). 10 This was probably Emperor Guāngxù (1871-1908), who lived to the age of 34, although possibly his predecessor Emperor Tóngzhì同治 (1856-1875) who lived only to the age of 19. Emperor Guāngxù was also basically the last serving emperor in practice, since his successor, Emperor Xuāntǒng宣統 (1906-1967), the last emperor of the Qing Dynasty (1644-1911/12) and thus the last emperor of China, only reigned until he was 6 years old (1912). China ruled Mongolia until 1911. 11 This is probably Manchu (or perhaps Mongolian) language, and it does not appear to be Chinese. Its meaning is unknown. 12 Elsewhere it is listed as being 91. One version of his collected works (see ‘Resources’ at the end) only lists 75 different works. 13 In some of his works, he signed himself as rab ‘byams ngag gi dbang po.